Yes, it's against the law. It violates the U.S. Flag Code and New Hampshire law (where he signed it) besides. 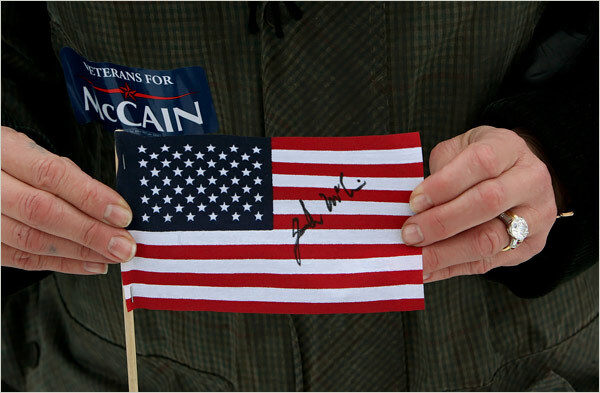 McCain, of course, has voted for the "Flag Desecration Amendment" at every available opportunity. The U.S. Flag Code -- passed into law on June 22, 1942. Last edited by Tennis702; 10-31-2008 at 05:36 AM.. I saw it on youtube! If you're a patriot, you'll support the president for the next four years. I'm a patriot and Obama's a patriot! Its funny in the GOP moment of desperation they break out all the tired old lies about Democrats, how we're marxist, socialist, communist, and now we're terrorists too and need to be investigated for our patriotism (remind anyone of McCarthy?). I'm not making this up, these are the ridiculous names Obama is being called, and a Republican Congresswoman as most people on this forum know told Chris Matthews liberals in Congress must be investigated for their patriotism. What in the world makes Republicans think for a second that they are more patriotic? If I will be called a socialist then I will call you a facsist. Well that got us far! In neocon-world, hating your fellow Americans is patriotic. But I thought the motto was "Country First!"? Look, it's all very straightforward. They don't hate America. they just can't stand 90% of the people who live here. They're "traitors." Didn't you get the memo? I don't think selecting Sarah Palin as his running mate demonstrated that McCain puts country first. It did however show us that he puts his campaign first. Raptor....you are starting to act like a troll with your repeat threads about patriotism.You have the same thing in a poll thread.Get a new line.